1. My yarn...diet. I've been seriously obsessed with my yarn. I keep going into the closets to look at everything. I've been fondling random skeins. I've been making lists galore. 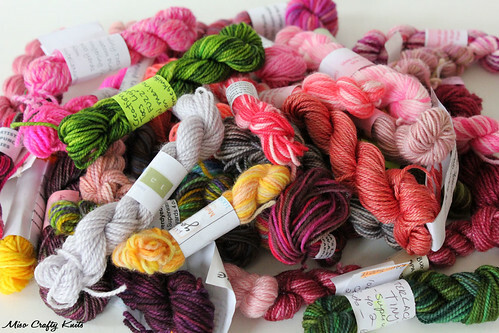 I've been digging up yarns long forgotten and putting away those that were received within the past few months. I've been obsessed with what's coming into the stash, what's going out, and what can be taken out. All the time. I think Stashdown is making me go crazy. Nonetheless, there you have it. Yarn has been on the brain all.month.long. 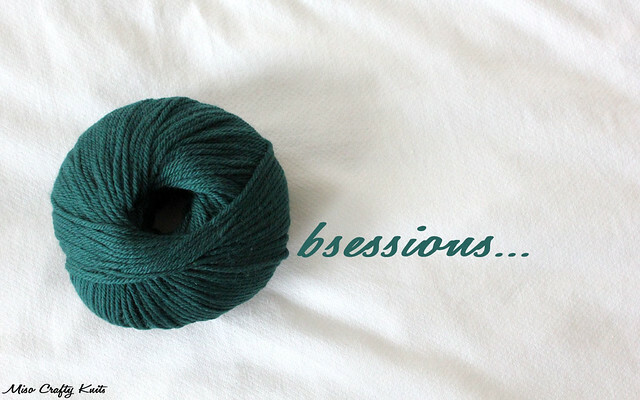 Since someone will ask, this pile of squishy yumminess is Tanis Fiber Arts Green Label in colourway Dove. I heart this colour and have been dying to knit this yarn up into this pullover...but I need to get over my fear of seaming first! 2. Random Acts of Kindness (RAKs). I'm not quite sure why but all month I've been compelled to do RAKs...whether it's secretly sending yarn to someone who would love it (and giggling away the entire time I'm doing it like a little school girl doing something naughty), leaving a small gift card in my mail box for my mailman, or paying for the person's order behind me in line at a coffee shop...I've just been wanting to share some love. Maybe it's cause I feel really blessed? Maybe it's cause I got irked when a neighbour made a crass comment in passing when I helped out an elderly neighbour bring in her groceries? Maybe it's cause I wanted to restore my faith in the kindness of others? Whatever it is I've been enjoying taking a little time each week to do something unexpectedly nice for someone else and not expecting anything in return other than the hope that my RAK has made them smile...and maybe make their day. I'd be lying if I didn't say that I hope that they pay it forward. I was also thinking of doing a Craft It Forward kind of RAK too, but am not sure if I can do my own crafty agenda as well as pump out five crafty things throughout the year without forgetting all about it. 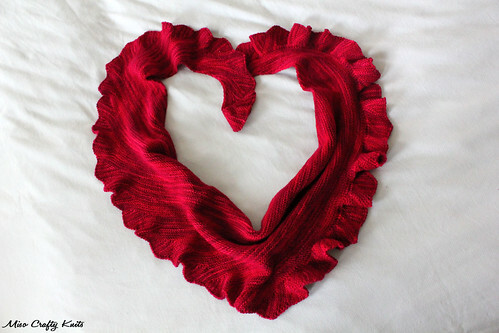 Have any of you ever participated in Craft It Forward? Did you like it? 3. Veera Välimäki patterns. It wasn't my intention to do so, but all the projects that I had cast on for during my bout of Starteritis are all by Veera Välimäki. 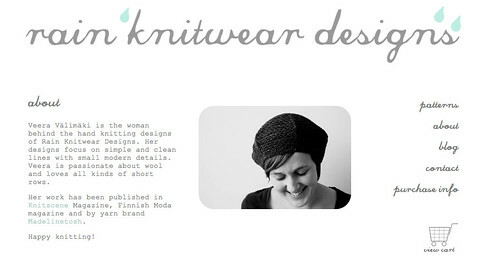 I've mentioned it before but Veera is one of my favourite designers (her and Jane Richmond are tied for first place). I absolutely love her simple, yet classic designs that always showcases clean lines and small details. 4. 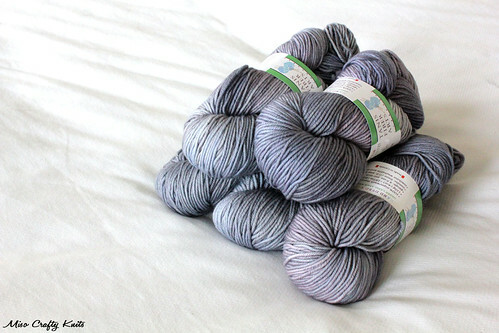 Mini skeins. I've been obsessed with not only participating in mini skeins swaps, but making minis from left overs and yarns that I'll most likely not knit with. They are just so darn fun to make and look so freaking cute! One day I will use up all these minis to make hexipuffs for my Beekeepers Quilt! 5. Lipgloss. Ok, this is probably more of an addiction than an obsession. But whatevs. I've always been a hoarder of lipgloss for as long as I can remember. I always have a handful of options in my bag, there's always a tube of it in my jacket pockets, and even though I don't always remember to re-apply I never leave home without it. I think my lipgloss obsession came from when I was in high school - when I was young and very impressionable. A cousin of mine, who is equally obsessed with lip products, had told me once (while putting lipstick on me) that I needed lipstick cause without it I look like I have no lips. For some reason, this stuck with me ever since. I'm not one of those lucky few who have naturally lovely coloured bee-stung lips and when I look at photos of myself without anything on my lips, I really do look like I have no lips. So all through high school I was obsessed and had numerous tubes of Revlon's Toast of New York lipstick (as I'm sure a lot of girls did back in the 90s!!). After high school I was all about the glossiest lipgloss ever. I was completely and totally all about MAC's clear Lipglass. I seriously went through tubes of this stuff in a matter of weeks! To date, I'm still all about the MAC lipglosses. Although, there was a stint back when I was travelling around Europe with Stephanie where I took every chance possible to stock up on the freebie samples of Lancome's Juicy Tubes lipgloss in Cherry Burst at Sephora (one memory that sticks out: Steph and I were in a Sephora on the Champs Élysées in Paris and since we were poor backpackers, we took advantage of the "DIY samples" and had squeezed out the entire tube into a sample container. We ran out of there so fast afterwards!). I do deviate from time to time and try out other brands but always come back to MAC. I think I've replaced my yarn buying with lipgloss. This month alone has already produced 3 new tubes. Eep! I better keep an eye on this trend. Don't want another thing to have to diet from! Well, there you have it. January is all said and done. Let's see what February has in store for us! receiving kindness and paying it forward is what makes us humans. and random acts of kindness make life worth living. i need to believe that whenever i make an effort, no matter how great or small, to better someone's day, it's a good thing in itself. that it has served the cosmic agenda of goodness that doesn't need to be returned by a bigger effort. and what really baffles me is that so many people just don't get it. they don't seem to understand that if i make someone happy i'm happy too, without any strings attached. now i'm gonna go wind me some mini-skeins. they're adorable. i wonder if "i need to sort out my leftover stash" is an acceptable reason to skip work? Thanks Liisa! I think lately I've been a little irked that a lot of people are expecting something in return for their "good deed". I'll admit that I even got a bit mad that someone had scoffed at me like I was an idiot for wanting to put together a welcome basket for a new neighbour, and had asked my I would want to do such a thing. I know that the times have changed, but people get so suspicious when you try to do something nice out of the goodness of your heart. So sad! guess who was doing some seaming last night? ME!!!! the I-don't-want-to-seam-anything-if-I-can-help-it girl! And it went really well! Go for it!!! Holy crap Nat! I want to know what you're seaming up there girlie!! !